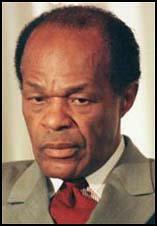 Marion Barry was born in Itta Bena, Mississippi, on 6th March, 1936. Barry received his B.S. from Le Moyne College in Memphis, Tennessee, and a M.A. from Fisk University in Nashville, Tennessee. In 1960 Barry became involved in the civil rights movement and became involved in the campaign against segregated lunch counters in Nashville. A founder member of the Student Nonviolent Coordinating Committee (SNCC), he was elected national chairman in April, 1960. While studying for his doctorate at the University of Tennessee, Barry was forced to abandon his full-time commitment to the civil rights movement. In 1964 Barry abandoned his studies and SNCC sent him to run its New York office. In 1979 Barry was elected as mayor of the District of Columbia. He held the post until 1990 when he was sentenced to six months in prison after being convicted on a drugs charge.